First up, let me introduce you to Ninjato from Z-Man games. That’s the board you can see above, but we can do one better than that. 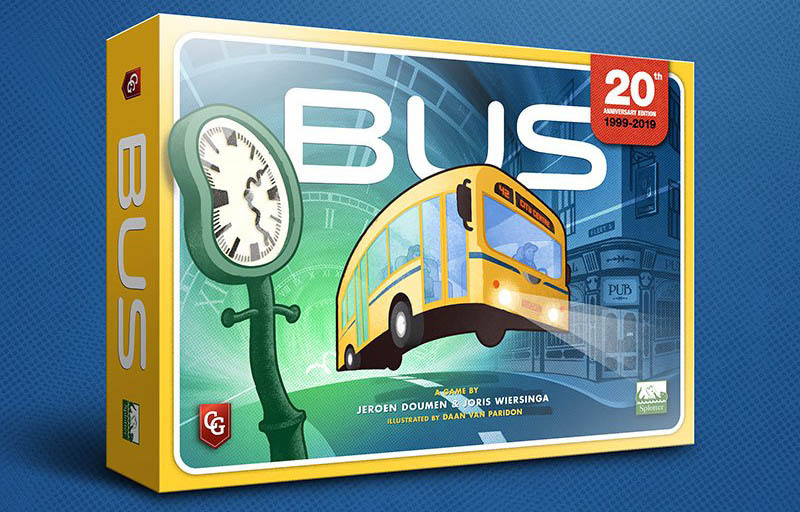 As is pretty common practice in board gaming, the rules have already been released online. Since I am nosy to the point of being nothing more than a massive nose, I’ve had a look. It’s by far the simpler and more accessible of the two games, and it’s also a bit abstract. In short, all the players are ninjas out to score the most honour so they’ll become the honourable Invisible Sword of the honourable ruling house. Aren’t ninjas meant to be entirely dishonourable? SILENCE, is what this game would say if it could talk. Anyway, the players are also competing so they won’t have to be the one who packs away the game. That’s actually in the manual, right there on page 10. My favourite bit in the manual, though, is in all capitals on page 4: “YOU INVADE HOUSES TO EARN TREASURE.” Yep, that sounds honourable alright. On your turn you can either train at the dojo or get the wise sensei to teach you a skill, both of which aid your HOUSE INVASIONS, or you can use your turn to spend your hard-earned HOUSE INVASION TREASURE to bribe envoys or spread rumours, both of which increase your HOUSE INVASION. Sorry, I mean your honour. 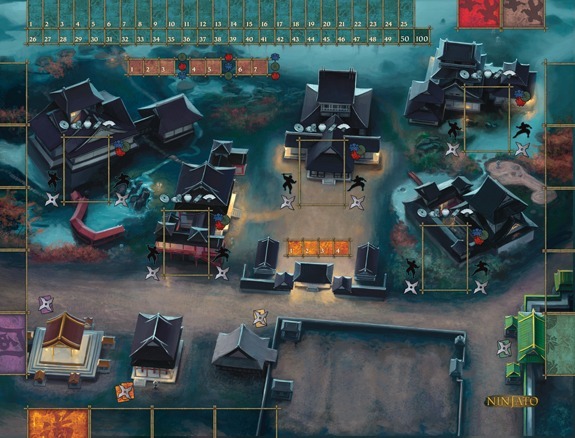 Ninjato sounds interesting enough, but relatively simple games like this one have a habit of being a lot more interesting to play than they are to read about. 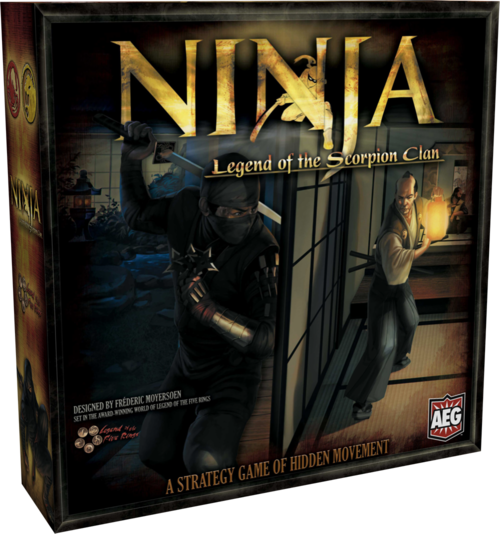 As such, I’m currently far more pumped about AEG’s upcoming game Ninja: Legend of the Scorpion Clan. Oof! That’s some box art, right there. “Ninja features fast play, hidden movement, limited information, bluff and guile,” say AEG. No abstraction here. Just one long night, with one or two players controlling a ninja or two who descend on a fortress to accomplish a nefarious, randomised objective, and one or two players controlling the guards. The ninjas are armed with climbing ropes, drugged sake, shurikens and more besides, but they also have the deadliest weapon of them all: the element of surprise. Urgh, that was awful. I’m sorry. The point is that it’s only once trace of a ninja is detected (you know, finding droppings, hearing their mating cries, etc.) that the guard players can start advancing through increasingly useful alarm levels. The reason the guard player might have trouble finding the ninja is because of that whole “hidden movement” thing. What hidden movement means is that the ninja players won’t place their figures on the board, instead marking their progress using a miniaturised map of their own. 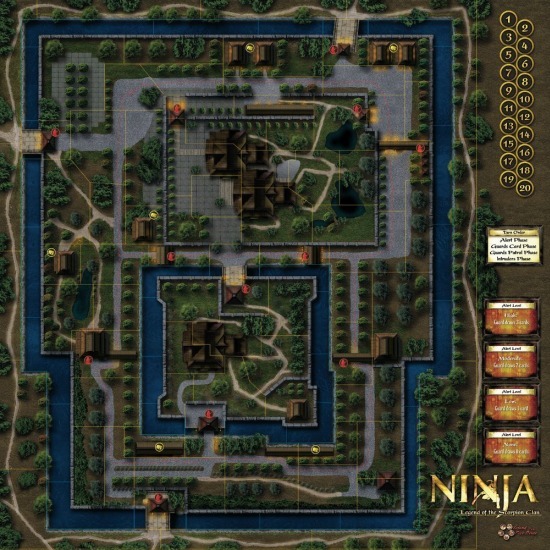 Guards will have to wander around, searching for any trace of a ninja in a murderous game of hide and seek. Hidden movement is a mechanic that’s appeared in dozens of game prior to this one (first showing up in a game called Scotland Yard and most recently in gorgeous Jack the Ripper-hunting game Letters From Whitechapel), but that’s no reason to not be excited. This idea positively steals any game it appears in. It’s that good. You want ANOTHER reason to be excited about Ninja: Legend of the Scorpion Clan? Are you this demanding to your friends and family? OK, OK. 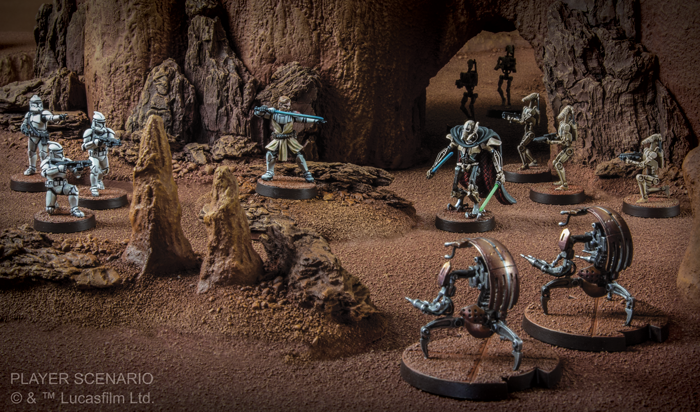 In a three player game, the third player gets to play a traitor on the guard team whose true loyalty lies with the Scorpion Clan. 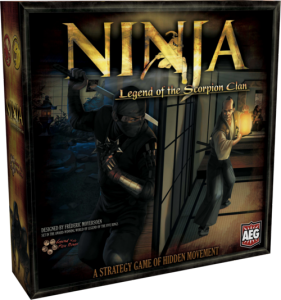 AEG have released almost no information about how this’ll work, except that the traitor can act either co-operatively or competitively against the ninja, and he’ll play very differently to either side. That has got to be great fun to play. Asymmetry in game design is like heat in a curry. It just makes things better. You’d better believe we’ll be bringing you some reviews just as soon as these games hit the shelves. Almost certainly with Paul dressed as a ninja, trying to sneak down a crowded street.